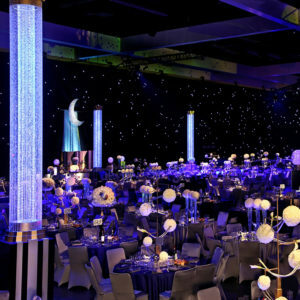 Let your imagination explode with color by using our RGB (Color changing) LED Star Drops. 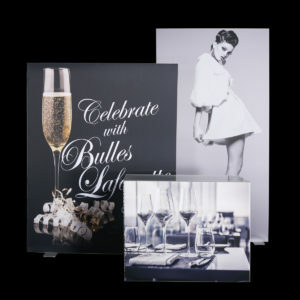 These drops allow you to create a galaxy of different colors and effects that will fit into your next event or production’s scheme. 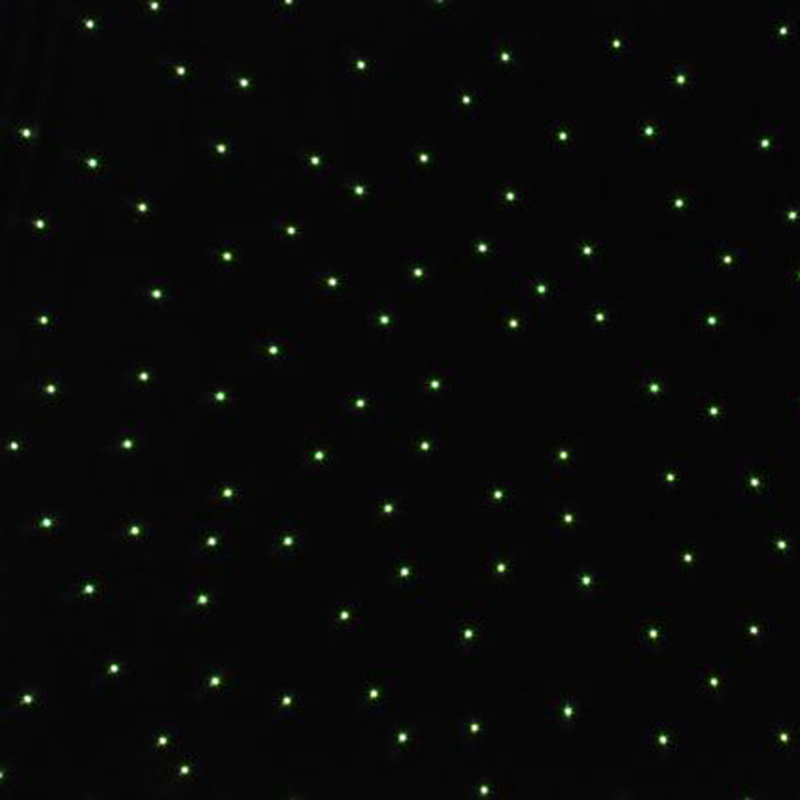 Create a galaxy of different colors and effects that will elevate your next event or production’s scheme with our RGB Color Changing LED Star Drops! Have a certain color in mind? No Problem. This system allows you to choose from a full spectrum of colors. The user-friendly Star Drop controller with LCD display will quickly bring your vision to life. 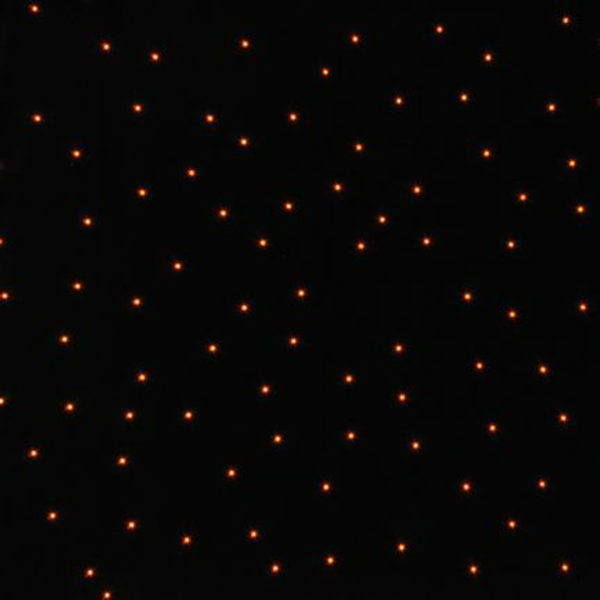 The Velcro® overlap feature on all our LED Rental drops easily seam multiple drops together to create a unique environment and/or a large stage backdrop. With the provided drape ties this relatively lightweight drop can hang from Pipe & Base, Truss or Batten systems. 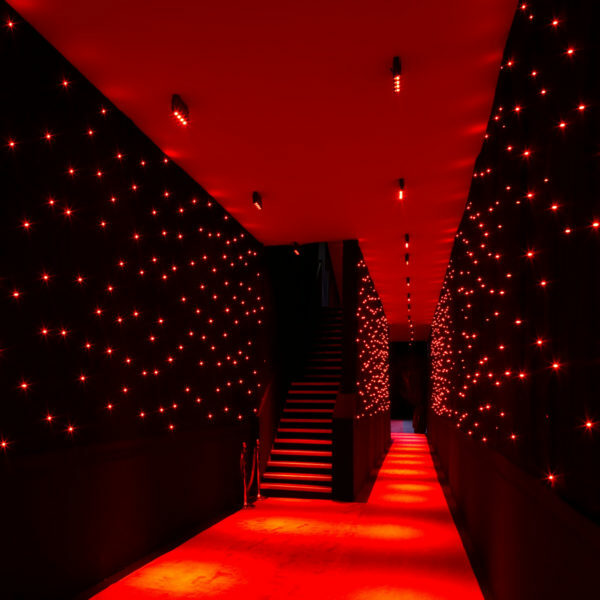 ShowLED Chameleon is an RGB Star Drop system offering easy programming options in a wide variety of colors. A clear and user-friendly LCD menu interface on the controller allows for quick navigation and selection of color, twinkling effects and chases. The controller can also be operated via DMX through a lighting console. Our Chameleon Star Drops are constructed from our 21oz. 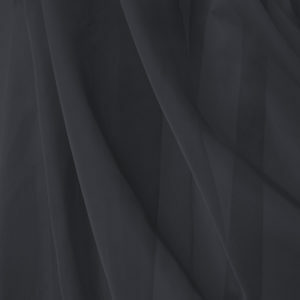 Black DaVinci Velvet Plus. Each Star Drop custom fabricated with LEDs placed in a random formation so no two Star Drops are alike. 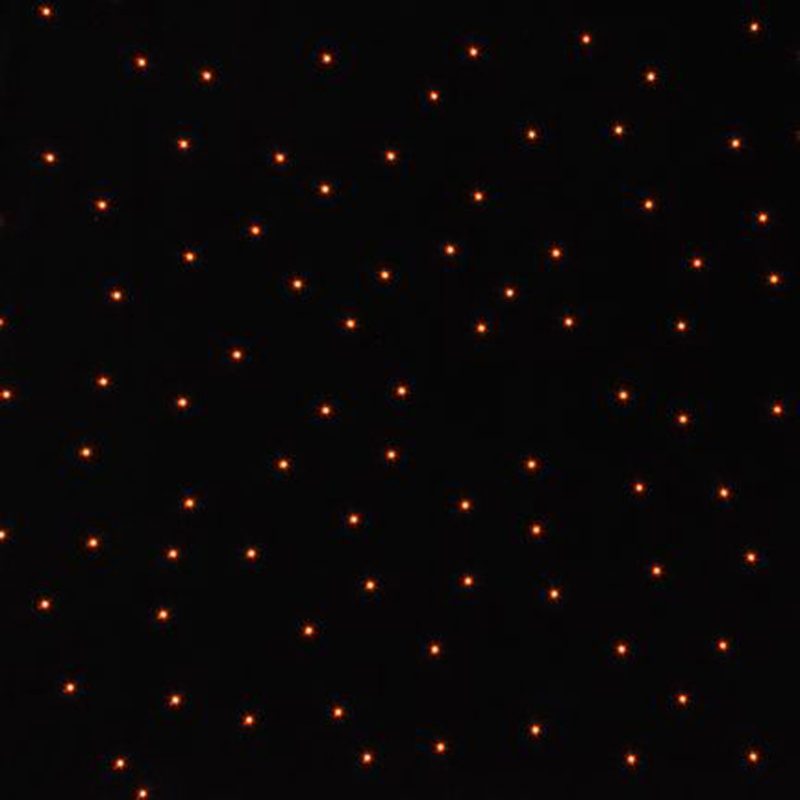 The LED density is one per two square feet; a single controller can operate up to 1024 square feet. 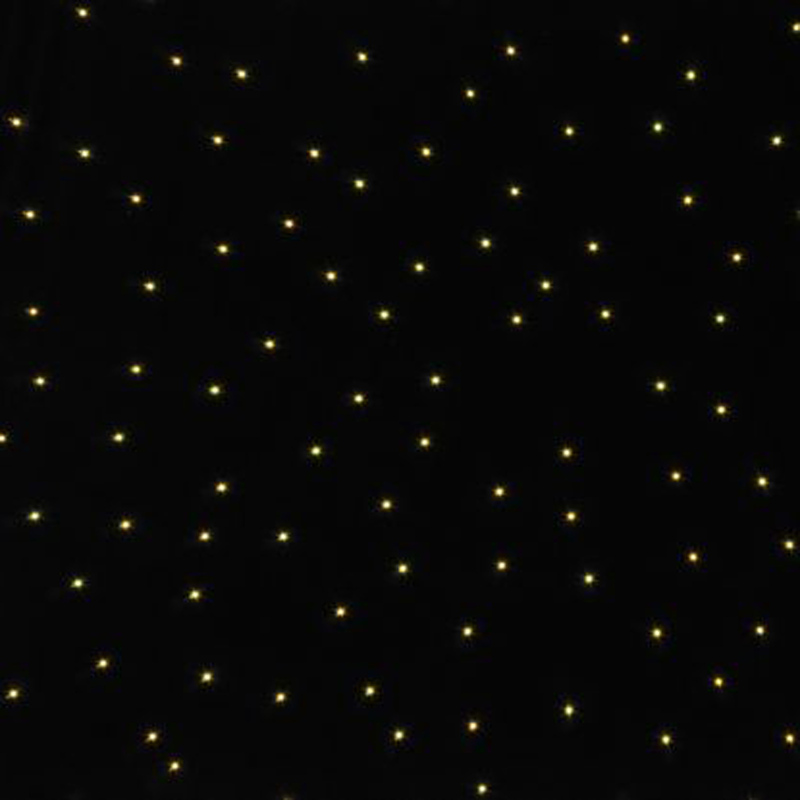 More controllers can be easily linked together through a master-slave configuration so when multiple Star Drops are seamed together the act as one large curtains. 8 output channels for driving RGB LEDs Stand Alone mode with Chase Patterns and Effects Memory. Chase Patterns: Stand Alone (or selected by DMX signal). Selection of hard or soft chase. Variable chase speed. A number of pre-defined patterns. Interactive color selecting. DMX Compatible: The DMX signal is cleaned up and amplified every time it passes through a controller. Two separate DMX Modes: Preset chases (via 10DMX Channels). Individual control 8 RGB output channels (via minimum 24 DMX Channels). Two or more controllers can be synchronized. The LED outputs are protected against short circuits. 4-line LCD display (20 characters per line). Master slave configuration.